Have you ever felt like an elder god, peering down upon tiny, unsuspecting worlds, deciding which insignificant planet will be first to fail to sate your inconceivable hunger? Just me then? Well, if you haven’t, and would like to, then chocolate planets might be the best way to go. Some time ago, I learned how to make Cadbury-style creme eggs over at Instructables (dangerously simple to make the insides) but my immediate thought was that instead of ‘eggs’, I wanted ‘planets’. Instead of whites and yolks, there’d be molten cores and magma. Instead of chocolate eggshell, there’d be chocolate planet crust. I 3d printed a hemisphere mold, but I’d not tried to use any kind of mold before, and instead of using the printed negative to make a food-safe silicone mold, I simply covered my mold with plastic food wrap (cling film). Let me tell you now – that is not the easiest, cleanest, or best way to go about it! However, I ended up with two hemispheres, filled them with that incredibly sweet, gooey, filling and sealed them with more chocolate. This was also before my experiments with candy-coating, so I painted my lone planet with strongly colored blue icing, leaving a little spot for it to sit on. When that dried, I covered the little sitting spot with more icing, resulting in a mostly smooth surface. Lastly, I got out a tube of green gel icing, and drew Europe and the Americas on the little blue planet – unfortunately not having drawn them small enough, I ran out of room for the other 4 continents. Also, unfortunately, gel icing is both semitransparent and non-hardening, so I ended up with a sticky sphere of sort-of planet. It was bloody delicious though. 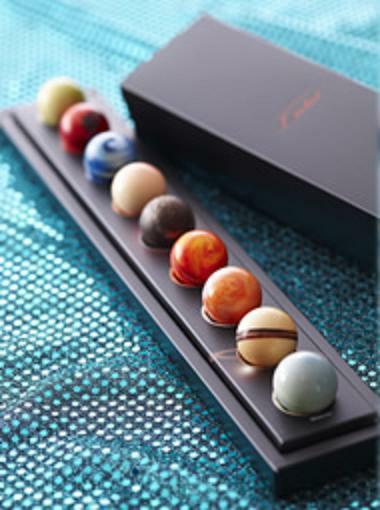 It seems, however, that professional Japanese chocolatiers L’éclat have made beautiful boxed sets of ganache filled planets. They look stunning, and while I might be a little confused by their coloring choices (Mars is mostly white, Earth has no green) they’ve certainly got me beat for polish and presentability. Unfortunately, I have no photographs of my first (rather mistake-ridden) attempt at planet creation – but I’m thinking about giving it another go. I’ve learned more about mold making, about candy-melts, and I may even make tiny landmass cutters for some green fondant, all the better to properly represent all the continents of the world. Should I do Antarctica in white fondant? Hi I have a couple of questions regarding your attempt to make these! I’m hoping to do this for my significant other before a special date. Please email me as soon as possible.